Home > Sports > Great Scott! The sport of rugby is often thought of as an international game that is played in countries such as Australia, New Zealand and England, to name a few. 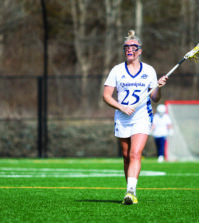 Although to many, the aggressive and physical sport is not thought of something that has a presence in the United States, that is not the case at Quinnipiac University. 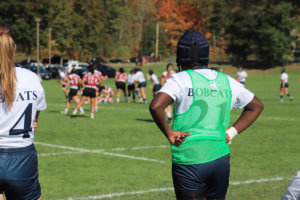 The predominantly-foreign sport has assimilated into Bobcat culture and continues to gain popularity, and for good reason. 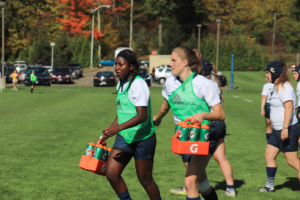 The Quinnipiac rugby team has emerged as one of the top women’s programs in the country, winning a national championship in each of its past two seasons. As the Bobcats continue to gain attention for their winning ways, it is vital that they continue acquiring prized recruits to come to the school in order to keep the winning tradition alive. Head coach Becky Carlson has excelled in recruiting, bringing in another strong freshman class, who have contributed a lot to the success of the team so far this season. One freshman whose impact on the team has been extremely significant both on and off the field is Layla Scott, a charismatic center from Oakland, California. She has four tries this season for a total of 20 points. Scott has also proven to be a disciplined player, not recording any penalties. Carlson knew that Scott was a can’t-miss prospect the first time she saw her play. Having her eyes up is something that Scott grew accustomed to before playing rugby, as she was a basketball player for most of her life. In fact, as Carlson stated earlier, rugby is something that she only took up in her senior year of high school. Even though Scott is no longer a basketball player, she still recognizes that having experience with the sport has helped her pick up rugby quickly. In a season that can often be difficult both physically and mentally for a freshman, she has lived up to the expectations that have been placed on her, putting together some stellar games so far this season. Her most notable performance came against the University of Norwich on Sept. 17 when she led all point-scorers with three tries, helping the Bobcats to a 52-7 win over the Cadets. In regards to her playing style, Scott could be described as the team’s version of the energizer bunny, as she is always playing with a lot of intensity and explosiveness. Having great speed, agility and overall athleticism is certainly vital in Scott’s production on the field, but that is not what she feels separates her from other players. This competitive spirit has been contagious throughout the entire team, as it has a record of 6-2 and a perfect 4-0 at home. The Bobcats are entering crunch time of their season with a crucial regular season game against American International College before getting ready for the NIRA tournament, where they look to capture their third national title in program history. 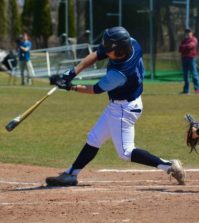 While it may seem out of the ordinary that Scott, a native of California, chose to play at Quinnipiac instead of a school closer to home, that is not the case. 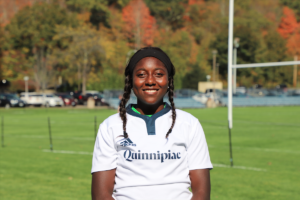 The Quinnipiac women’s rugby team is one of the most diverse teams on campus, with players from 13 different states, as well as one player from New Zealand. 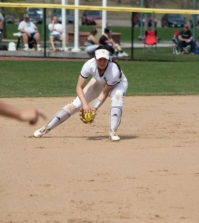 And despite living in a much different environment for most of her life, Scott has adjusted quite well to life at Quinnipiac and her teammates agree. Being a rugby star isn’t the only thing that Scott is interested in. She was an honor student at Bishop O’Dowd High School, boasting a 3.68 grade point average. A psychology major, Scott hopes to work with athletes in the future. The freshman spark plug still has a lot more to give, as does the team as a whole. The Bobcats close out their regular season on Oct. 28 before they begin the journey of claiming yet another NIRA title.